Psychiatrists, Clinical Psychologists, Counseling Psychologists, Psychologists, Special Educators, Occupational Therapists, Physicians, Medical consultants, Neurologists, Yoga Therapists, Physical Trainers, Accountants, Receptionists, Marketing Executives. Mental Health care in India is still due to get its recognition and importance when compared to other segments of health care. The awareness in the community about the mental health problems is also very limited. Adding to this awful situation is the lack of trained manpower in the mental health care. With every passing day the number of people with mental health problems is increasing while the needed manpower to help them is unavailable. Even those who are trained in counseling and mental health care lack many critical skills and exposure which is very essential for them to be effective and helping the people with mental health problems. Mind Zone offers Student Certification programs that provide useful practical knowledge and experience. Interested students of Mental Health programs can contact us for more information – Click Here. Mind Zone is also an accredited centre for observation and internship training of graduate and post graduates students of Psychology from Universities in Chennai and south India, for the past 2 years. We also provide training in Clinical Psychology and Psychiatric Social work for Post Graduate students of the relevant streams. Every year more than 50 students of post graduate courses in psychology get oriented and trained in relevant aspects of clinical psychology and rehabilitation. 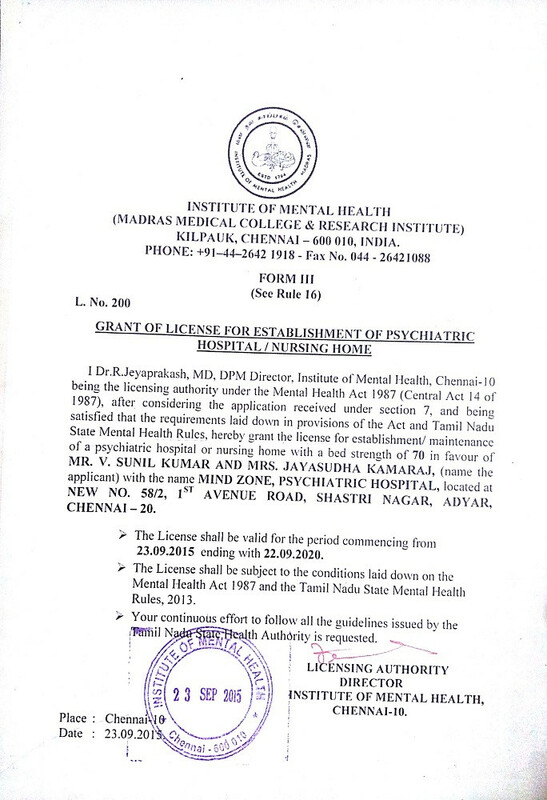 Undergraduate students of Psychology also allowed attending Mind Zone in batches, for exposure to the field of organized rehabilitation/ Psychiatric Care and Psychological testings/ Intervention. M.S.W. (Master of Social Work) specifically for orientation, block placement and internship in psychiatric social work. There is a need for clinical exposure in psychology, in order to consolidate the theoretical and academic learning, which is best done in the clinical environment of a mental health institute. This cadre of professionals is needed to fulfill the acute shortage of trained personnel in mental health field. This course is conducted and supervised by Psychiatrists, Clinical Psychologists, Counselors and Allied mental health professionals experienced in managing patients with acute and chronic mental health issues and illnesses, in outpatient settings as well as in rehabilitation. Mind Zone offers workshops for student groups.